An SUV for the track, with mumbo to match. It's gen-u-whine Americana. Where can you 'drive' it? Many things make no sense. For example, a truth-averse, comb-over enthusiast in the White House, YouTube comments, and Pokémon GO. Apply logic and their reason for being collapses, yet they exist. In fact, they provide amusement and satisfaction for people all over the world. Which is where the Jeep Grand Cherokee Trackhawk blasts into the frame. No one needs a 700-horsepower SUV. No one asked for a 700-horsepower SUV (well, some lunatic who works at Jeep did). But here it is, a mad muscle car/SUV mash-up powered by a 6.2-litre supercharged Hemi V8, borrowed from the Dodge Hellcat twins. CarsGuide was invited to a track-only session to experience its monumental thrust and surprisingly polished dynamic performance. 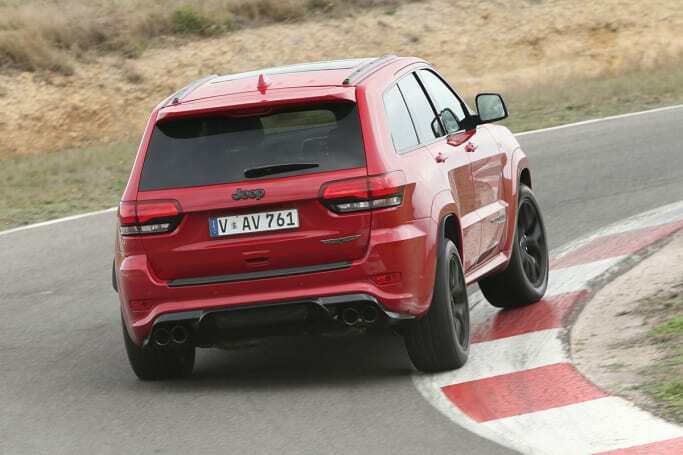 The Jeep Grand Cherokee Trackhawk is an imposing machine, measuring just over 4.8 metres nose-to-tail, more than 1.9 metres across, and around 1.7 metres high. That's longer (+18mm), wider (+11mm), and lower overall (-54mm) than the already sizeable garden-variety version. If the design looks familiar, it's no surprise given the current, fourth-generation (WK2) version of the Grand Cherokee has been around since 2010. 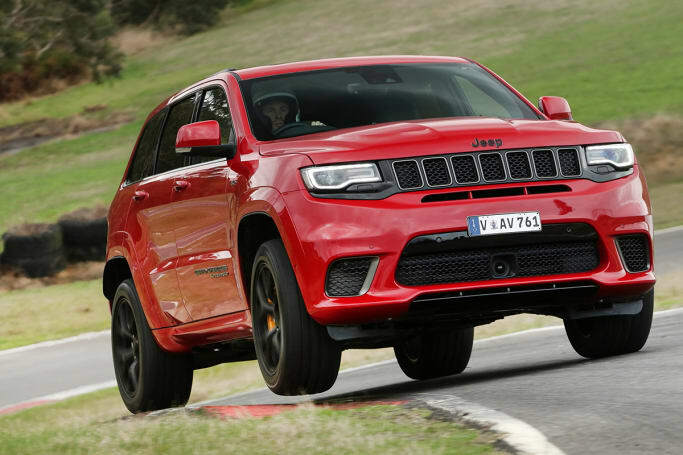 The Jeep Grand Cherokee Trackhawk is an imposing machine. 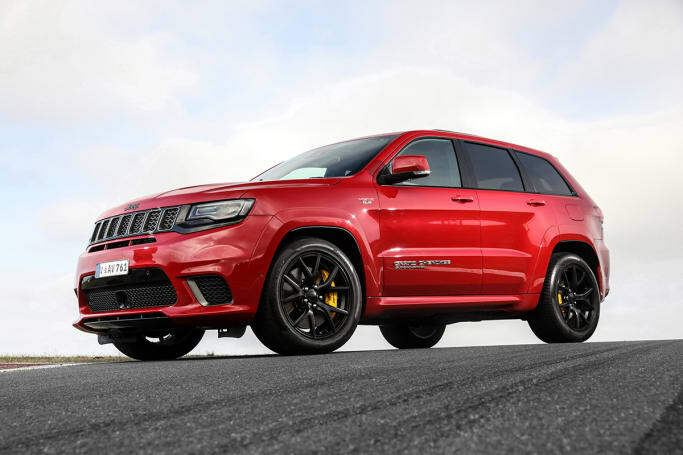 At first glance, car spotters will tag the Trackhawk as the only slightly less deranged SRT version, given its big 20-inch rims under flared wheelarches, wider track (+12mm front and rear), aggressive nose treatment, and deep, heat-extracting vents recessed into the bonnet. But the detail in this devil makes the difference. Look closely, and you'll notice the SRT's fog lights have been flicked to make way for oil cooler and air-intake vents. The enormous yellow Brembo brake calipers are another clue. A gloss black rear valance panel and 4.0-inch 'Black Chrome' quad-exhaust tips are unique. A gloss black rear valance panel and 4.0-inch 'Black Chrome' quad-exhaust tips are unique. And there's a winged Trackhawk logo on the tailgate, plus a 'Supercharged' badge proudly attached to each front door. 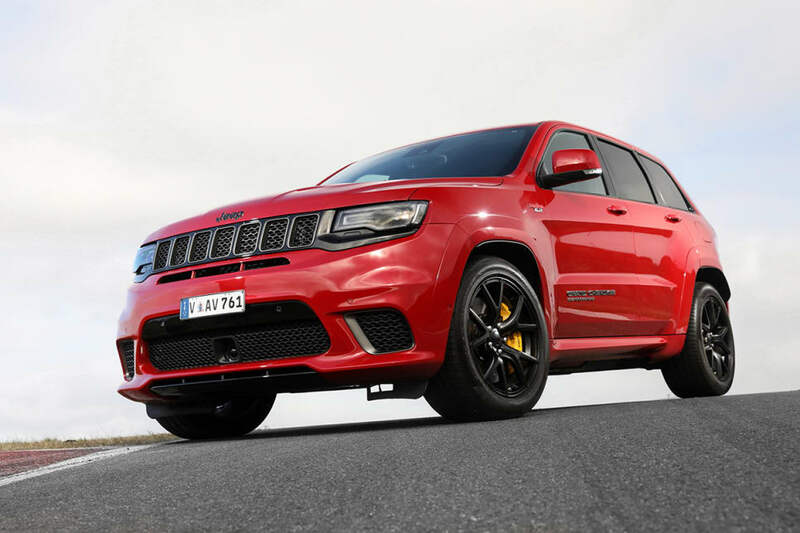 The overall effect is tough without a hint of Las Vegas flash, although the Trackhawk dials up the characteristically Jeep interior with lots of brushed metal, chrome, and racy carbon-fibre highlights contrasting with the dark dashtop and steering wheel. Grippy leather-trimmed sports front seats look and feel great. Engage launch control and blaze from 0-100km/h in 3.7 seconds. Ripping around one of the fastest race circuits in the country isn't the ideal time to assess a car's practicality, unless by practicality you mean staying on the circuit and arriving back in pitlane in one piece. 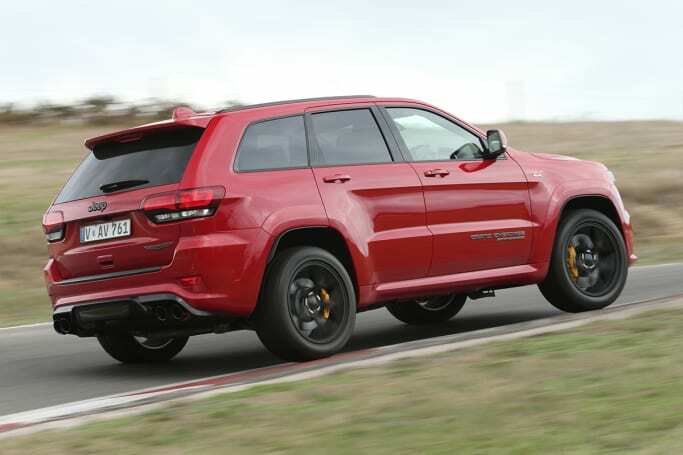 But for the record, the Trackhawk retains the day-to-day practical features found in other premium Grand Cherokee models. This is a full-size, five-seat (only) SUV and there's plenty of space up front, with a pair of 'Murica-sized (illuminated) cupholders in the console, as well as a lidded box between the seats, substantial door bins with bottleholders, a decent glove box, plus two USB ports, a 12-volt outlet, and an 'aux-in' socket. Rear head and legroom is generous, with the fold-down armrest offering up another pair of cupholders, there are adjustable air vents for backseaters, with a 12-volt plug underneath, and bottle holders in the doors. The Trackhawk retains the day-to-day practical features found in other premium Grand Cherokee models. At 782 litres, there's enough cargo space to easily swallow our three-piece hard suitcase set (35, 68 and 105 litres) and the CarsGuide pram, with heaps of room to spare. Pull one of the levers in cargo area to flip the 60/40 split-folding seatback forward and that figure pushes out to 1554 litres, which is almost enough to house a Kia Picanto as a tender. There are four rubbing strips running the length of the cargo floor, which is a nice touch, four tie-down shackles, strategically placed shopping bag hooks, a small storage well behind the passenger side wheel tub, a 12-volt outlet and useful lighting. The rear door opens and closes automatically via the key fob, the exterior handle, or a button located at the base of the passenger side rear pillar in the boot. That third option makes a lot of sense, especially for the vertically challenged who might find the more typical positioning on the trailing edge of the door, well... challenging. The standard Pirelli Scorpion and optional P Zero tyres are run-flats, however a steel space-saver spare wheel is still included, and if you're keen on towing, 2949kg is your limit for a braked trailer, and 750kg unbraked. Cost of entry to this world of four-wheel drive lunacy is $134,900 (before on-road costs), which is a lot for a Jeep, and around $50k more than the already unhinged Grand Cherokee SRT. But it's cheap next to (slower) high-performance SUV offerings from the big three Germans, and others. And for that money you'll get as many trimmings as a Fort Worth Ribeye from the Texas Roadhouse, the highlights being: dual-zone climate control, keyless entry and start (including remote start), 'SRT Performance' instrument cluster, power tailgate, heated and ventilated front seats, heated steering wheel, heated rear seats, auto headlights, rain-sensing wipers, electric front seats (with audio, driver's seat and mirror memory), auto high beam, LED daytime running lights and tail-lights, and adaptive cruise control. It has 20-inch forged alloy wheels, wrapped with (295/45) Z-rated Pirelli Scorpion Verde all-season rubber. 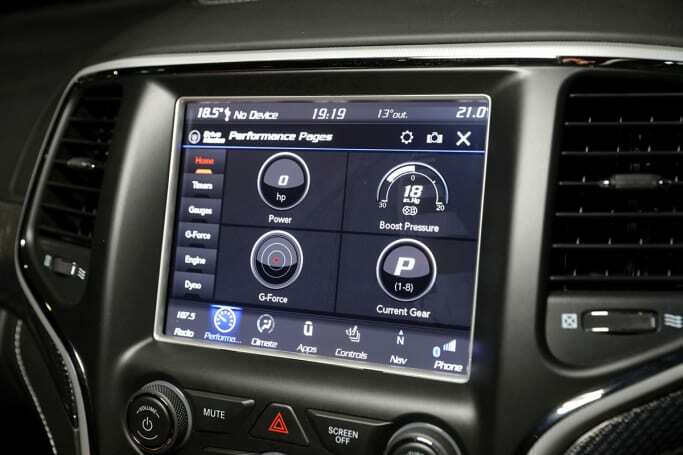 The media set-up is built around Jeep's 'Uconnect 4' system with an 8.4-inch touchscreen display managing a never-ending series of performance timers and read-outs, as well as the standard sat nav, Bluetooth phone connectivity and audio functions. That harman/kardon audio system is of 'eat it and it's free' proportions, featuring 19 speakers, an 825W amp, digital radio, as well as Apple CarPlay and Android Auto support. But there are still a couple of courses to go, with park assist (parallel & perpendicular), a dual-pane panoramic sunroof, electric steering wheel adjust, and 20-inch forged alloy wheels, wrapped with (295/45) Z-rated Pirelli Scorpion Verde all-season rubber, also standard. A set of lighter 20-inch forged rims shod with Pirelli P Zero three-season tyres (saving 5.5kg of unsprung weight) is a $3250 option. 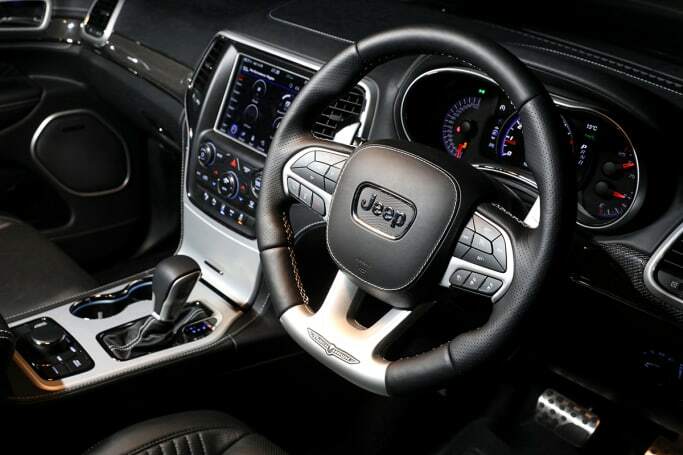 The media set-up is built around Jeep's 'Uconnect 4' system with an 8.4-inch touchscreen display. Then there's enough high-quality leather to make a Kansas cattle rancher proud, with neatly trimmed hide on the seats, instrument panel, centre armrest, door inserts, gearshift knob and flat-bottom sports steering wheel. Add in the monster drivetrain, high-performance suspension hardware, topped off by loads of active and passive safety tech, and you have one helluva features list for the money. 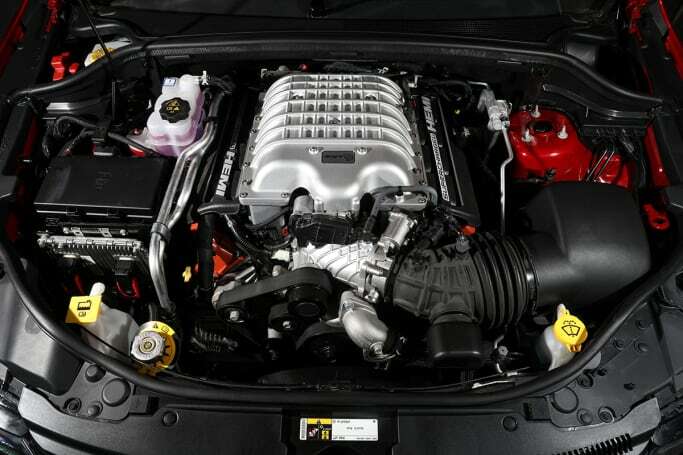 The thermonuclear device residing under the Trackhawk's bonnet is actually a supercharged 6.2-litre Hemi V8 producing a more than adequate 522kW (700hp) at 6000rpm and 868Nm at 4800rpm. It's built around a cast-iron block and features forged alloy pistons, alloy heads, and hollow-stemmed, sodium-filled exhaust vales. A heavy-duty engine-cooling system helps keep core temperatures under control. The thermonuclear device residing under the Trackhawk's bonnet is actually a supercharged 6.2-litre Hemi V8. The 2.4-litre, twin-screw blower adds up to 80kPa (11.6psi) of boost pressure and can spin up to a maximum speed of 14,600rpm, adding a distinctive howl in support of the engine's full baritone bark. Backing up that impressive chunk of Detroit iron is the standard eight-speed 'TorqueFlite' auto transmission (can you believe that name's still around?) featuring wheel-mounted shift paddles, and delivering drive to the 'Quadra-Trac Active' four-wheel drive system at a default distribution of 40 per cent to the front axle, and 60 per cent to the rear. Most of the Trackhawk's instruments deliver fun information like revs, speed, G-loads and lap times, but reality hits hard when the fuel gauge ranges into view. The tank is huge (93 litres), 98 RON premium unleaded is your only option, and this car drinks like a US Navy seaman on shore leave. Claimed fuel economy for the combined (ADR 81/02 - urban, extra-urban) cycle is no less than 16.8L/100km, and if you sink the slipper into that ocean of torque on a regular basis there's little doubt you'll easily push into the mid-20s. You can script a new Trackhawk owner's first day with their new toy. Load it with friends and/or family, find a 'private road' away from traffic and the long arm of the law, engage launch control and blaze from 0-100km/h in 3.7 seconds. Cue screams and excited yelps as the captive audience is flung backwards in a storm of 'horsepower defying mass and inertia' acceleration. Job done. Put it in the garage. You're a hero, beaming from ear to ear. Straight line acceleration is the Grand Cherokee Trackhawk's go-to party trick. 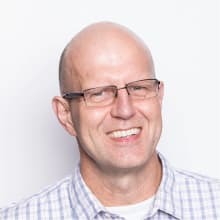 Jeep says the launch-control system has been tested 2000 times back-to-back, and there is no limit on the number of all-out acceleration runs the car can do. Put it this way, one of the graphic screens available in the 7.0-inch digital driver information display in the main instrument cluster is a drag strip Christmas tree light sequence (modelled on a 500 Sportsman set-up), with reaction time, elapsed time, and maximum speed read-outs recorded. 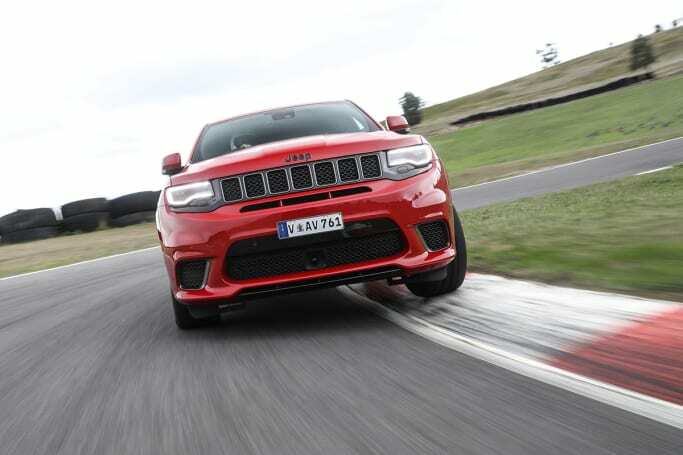 The Trackhawk can transform its jaw-dropping velocity into eye-opening cornering speed. The launch-control setting can be tweaked in 100rpm increments to account for ambient temperature or track-surface changes and the system works with satisfying accuracy and reliability. But that doesn't mean the Trackhawk can't transform its jaw-dropping velocity into eye-opening cornering speed, and a track as big and ballsy as Phillip Island, due south of Melbourne on the edge of Bass Straight, proved the perfect place to explore this epic machine's dynamic abilities. Jeep's multi-mode 'Selec-Trac' system controls the four-wheel drive system, transmission, paddle shift response, suspension calibration and the 'SRT-Tuned' electrically assisted steering. The usual suspects are there in the shape of 'Auto', Sport', 'Tow', and 'Snow' settings, but this beast has a trick up its sleeve - 'Track' mode, which tightens the stability control, splits torque 30 per cent front/70 per cent rear, and dials everything else up to maximum attack. Peak torque arrives at just under 5000rpm, with maximum power taking over at 6000, which is when all hell really breaks loose. No surprise, the rear drive shaft and rear axle have been strengthened to cope with it all. In Track mode, gearshift times come down by a claimed 68 per cent (vs Auto) to 160ms, literally half an eye blink. Speed down PI's long-start-finish straight was immense and washing off speed in preparation for entry to the circuit's daunting Turn One came courtesy of mega Brembo brakes, with two-piece (400mm) ventilated rotors clamped by six piston calipers up front, and (350mm) vented rotors and four-piston calipers at the rear. Which is good, because this battleship weighs a smidge less than 2.4-tonnes, but the big stoppers work brilliantly. In Track mode, gearshift times come down by a claimed 68 per cent (vs Auto) to 160ms, literally half an eye blink. But it pays even more than usual to be ultra-smooth, because just a minor cornering hiccup will remind you you're behind the wheel of a big, heavy machine, with a high centre of gravity. Suspension is a short- and long-arm set-up at the front and multi-links at the rear, with coils and Bilstein adaptive dampers all around. The Bilsteins help keep all that weight under control, and the electronic rear limited slip diff puts the power down with authority, even on the exit of tight corners like the 'Honda' hairpin and the bottom of 'MG'. 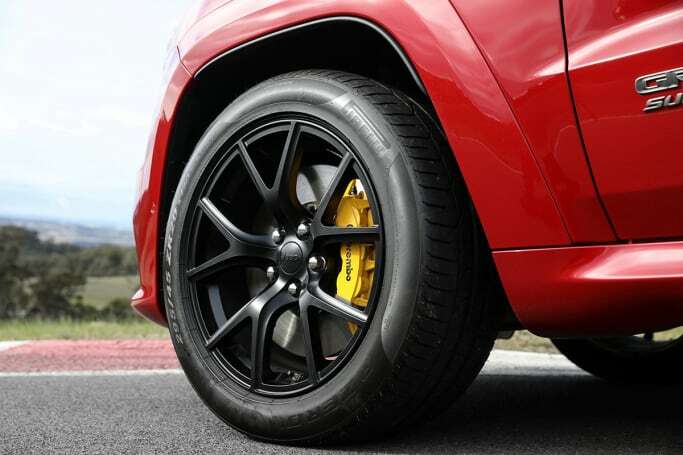 We spent most of our track time on the optional lightweight 20-inch forged alloy rims, shod with Pirelli P Zero rubber, and the electronically assisted power steering points accurately and provides good feel in Track mode. Which is just as well because claimed maximum velocity is 289km/h and the speed and screaming soundtrack through the long, sweeping 'Haysheds' right-hander was amazing. No SUV has a right to do what this one can. It's a fair bet 99.9 per cent of Trackhawk owners won't be thinking about dirt, mud and rocks. But for that tiny sliver of owners who do choose to take this machine off-road, its approach angle is 18 degress (exactly half the high-riding Trailhawk's number), breakover is 18 degrees, and departure is 22. The Trackhawk isn't all fire and fury, though. It's loaded with an impressive portfolio of active safety tech including a reverse parking camera, working in parallel with front and rear proximity sensors, 'Forward Collision Warning Plus' (Jeep-speak for AEB), lane-departure warning, blind-spot monitoring, 'Rear Cross Path Detection', 'Advanced Brake Assist', a tyre-pressure-monitoring system, ABS, ESC, traction control, 'Ready Alert Braking', 'Rain Brake Support', and trailer-sway control. If all that isn't enough to avoid a crash, the car is fitted with seven airbags (two front, two side curtain, two side seat, one driver's knee), active head restraints, and Jeep's 'Enhanced Accident Response System' (cuts fuel to the engine, flashes hazard lights, turns on interior lights, and unlocks the doors). There are three top-tether points for child seats or baby capsules across the back seat, with ISOFIX anchors on the two outer positions. And the Grand Cherokee rated a maximum five stars when assessed by ANCAP in 2014. Jeep offers a five year/100,000km warranty with lifetime roadside assistance (as long as you continue to have the vehicle serviced at an authorised Jeep dealer). Recommended service interval is 12 months/12,000km, with pricing for the brand's five-year capped-price servicing program lining up as $595, $785, $595, $1215, and $2175, for an average of $1073. Not exactly cheap, then. This Franken-Beast Grand Cherokee Trackhawk SUV is all about fun. Storming acceleration with the sound and theatre you'd expect to go with it. It's good value, too. Just be prepared for the big bucks required when you roll up to the bowser or into the workshop. But like they say in the US of A; less is for losers, more is for winners. And this Trackhawk is smile-inducing evidence of that. Amazing or obscene? Tell us what you think of the Jeep Grand Cherokee Trackhawk in the comments below. 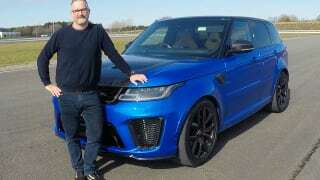 If you like your luxury SUVs loud, fast and fantastically fun, then Land Rover Sport's SVR is your cup of supercharged tea. 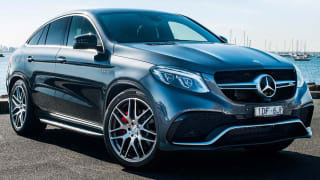 Joshua Dowling road tests and reviews the 2015 Mercedes-AMG GLE 63 S Coupe with specs, fuel consumption and verdict.